T-R PHOTO BY SARA JORDAN-HEINTZ The Marshalltown Christian School (MCS) offers students K-8 a Christ-focused education experience where classroom size stays 15 pupils and below. Here, first year teacher Sarah Braun (pictured) teaches fifth and sixth grade science students about plants. 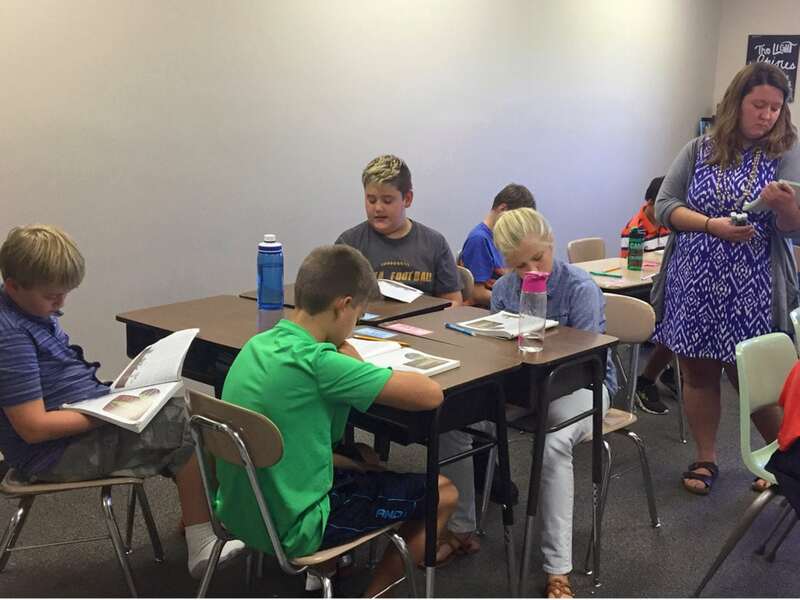 The Marshalltown Christian School (MCS) offers students K-8 a Christ-focused education experience where classroom size stays 15 students and below, and the building has what second-year Principal Bethany Wirin calls a “family-like” atmosphere. In past school years, math and reading classes had students from two or more grades all learning in the same classroom setting. The school also welcomed two new instructors this year – Sarah Braun, a fifth and sixth grade science teacher, and Barbara Perry, who teaches seventh and eighth grade science. This is Braun’s first year working as a teacher, while Perry has 30 years experience in academia. Wirin said she welcomes her staff to look beyond traditional classroom concepts when planning curriculum, field trips and projects. This school year marks the first occasion in which all grades spend lunch and recess time together. Currently, 56 students are enrolled at MCS, with a staff of five full-time and two part-time teachers. Many of the students at MCS are dual-enrolled, spending some afternoons in the public schools taking music courses and playing sports. While the school does have a music class, for K-2, Wirin said they’d like to see music education expand. “I would like to eventually have a music program – parents would love to see more programming like that,” she said. Wirin said she also envisions creating a unit of study in which pupils can immerse themselves in a historic time period. “For next year, we’re looking into building a study unit where we would have a theme for even a full quarter, where it would be a period of time where we’re looking at its science, history, political history, literature, music and art, trying to encompass everything in that time period. But we have a lot of work to do to build up to that,” she said. When asked what she values most about what the school offers, Wirin said she enjoys its small, family atmosphere. “That’s something people have always said about this school – early on it felt like a family-like atmosphere, and that’s really important to me,” she said. For more information, the school may be reached at: 641-753-8824.